Anytime I'm invited to a party, my first thought is, I wonder what kind of food they'll serve? A good guest list is nice, a theme is fun, and hooray if it's a cool venue but if it's a party with drinks and a cheese plate, in the words of my favorite internet celebrity, "ain't nobody got time for that." Look, we can hug and air kiss and squeal at seeing each other at a party, but you should know I'm basically just zeroing in on the dessert table and on the folks passing the fancy apps around. So when this month's Blogger CLUE theme was revealed as "celebrate," I thought it was perfect for the holiday season but even more perfect given my love of party food. I was super excited to be paired with Lea Ann again because her fantastic Baked Ziti is a regular in our dinner lineup! If you're not familiar with her blog, Cooking on the Ranch, it's the best combination of hearty meals and fun treats that are perfect for a party of 1 or 100. Take a look at her Chocolate Tart! Can someone please invite me to a party and make this? Heck, we don't even need a party. Just make this, send it to me, and I'll eat it in my pajamas, in front of the tv and call it a party. Or her Creamy Banana Coffee Cake. If you make this for a party, please make two because I'm sure I can eat a whole one by myself. As much as I wanted to make a party dessert from her blog, I've already eaten a year's worth of desserts this month so I wanted to do a savory party dish (who am I?!). I was scrolling on through when I happened on her Mexican Meatballs with Queso. Oh hello! Now, I don't normally consider meatballs to be party food because my allegiance to spaghetti and meatballs is strong. But then I remembered that I was once invited to a party where the host served meatballs drenched in BBQ sauce in a crock-pot. I'd never seen meatballs in a party setting before, much less in a crock-pot, and I pretty much lost my mind. I spent the entire party parked squarely in front of the crock-pot, eating my weight in meatballs. I vaguely remember that at one point, the Hubster tried to grab my hand to force me to move. He lost because I'm a dead weight when meatballs are involved. I made up a giant batch of Lea Ann's meatballs on a regular ol' weeknight. I served 'em with fancy little toothpicks, and we ate them standing around our kitchen counter, drinking water out of plastic toddler Ikea cups. We were celebrating just another week of food and family which is definitely worthy of celebration. And these meatballs were delicious! I can only assume they'd be even more perfect for a real party, drenched with some sauce and served in a grand ol' crock-pot. Heat oil in skillet. Fry diced onion until translucent. Mix with remaining ingredients. Scoop out 1 tablespoon of meat, roll into ball. Repeat with remaining meat mixture. Heat additional oil in skillet and fry meatballs. Serve with BBQ sauce, marinara, or queso. SO spicy and irresistible! I could make these my dinner, too! I love, love, love party meatballs ... more so than the kind that go over spaghetti, in fact. Like you, we just stand around the counter and shovel them in our mouths. That's what appetizers are for, right? Oh Azmina...I just love your posts...I always leave them with a smile on my face. I always find myself parked in front of the party meatballs, too. So glad you've discovered the joy. Great to see you on Saturday! 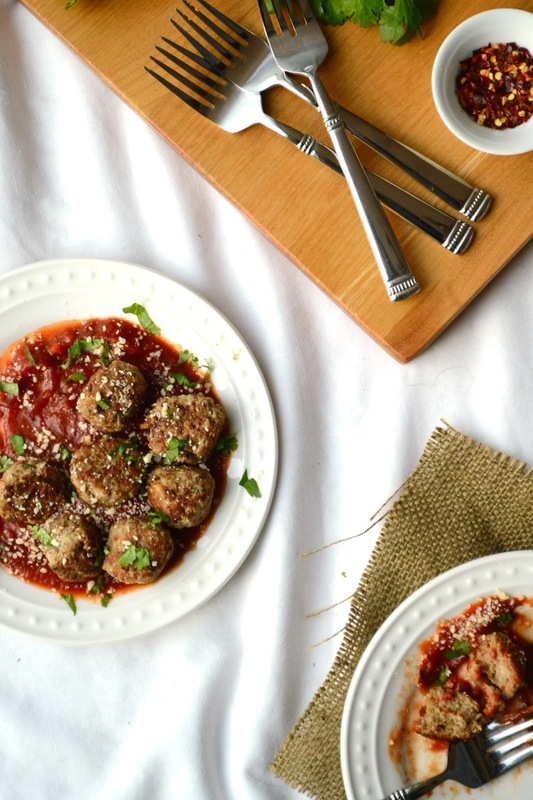 These are certainly celebration worthy meatballs - love your cover photo! Cheers. Love, love, love the queso idea! Happy holidays! I love me some meatballs for a party! I plan to serve some at our Christmas party coming up. : ) Hope you are having a great holiday season so far!! Great choice! 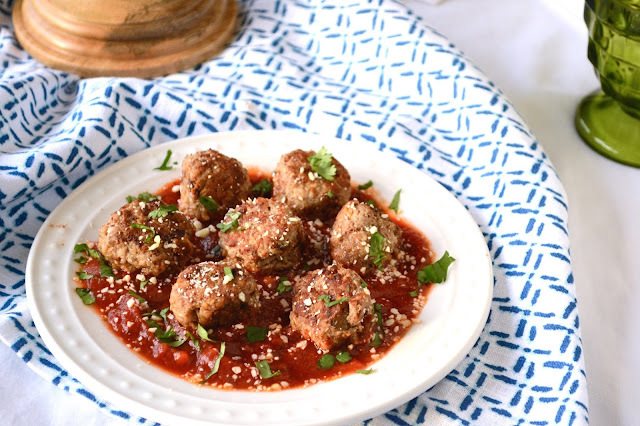 Meatballs are definitely the perfect party food! Had a great time cooking from your blog this month. Happy Dishing! why have i not thought about serving this with queso..you just made my day. The queso idea is genius right? I bet they'd be fantastic as nachos (chips + meatballs + queso)! I'm thinking these could easily be called "dinner"! And I have a newly arrived home 19-year old boy who could polish off a plate!! Meatballs scream celebration. They look good and the curry has such a rich color. This just made me giggle and the meatballs looks pretty incredible! These look so delicious! I wish I was having these for my lunch! Just wanted to salivate over these tasty meatballs and wish you and the family Happy New Year!! Can't believe another year and more good times ahead, hoping its the best ever for all of you. Say hi to little man and little lady for me and that I hope Santa was really good to them. Party meatballs are looking so delicious and tempting for any holiday party. Next time whenever I will throw a party for my good friend I will try to include meatballs in my menu items. I am sure everyone will be enjoying the food.